Each exhibitor will get tabletop space provided by the event organizers (skirted tables). You should be receiving a separate email from The MIX with instructions for getting your show pass shortly. Upload your files to this form by Monday, August 3. We will take care of getting signs to convention center for SIGGRAPH. Be sure to bring external speakers and/or headphones for people coming to your kiosk. We will have complementary 24-26″ monitors available for exhibitors who need them (one per game), provided by partner Intel. For setup on Saturday everyone will need a special setup pass. When you arrive to the convention center Kiersten Stokes from the SIGGRAPH team will be stationed at the check in desk at the entrance to South Hall G of the LACC this weekend to distributed the work passes as your participants as they check in. 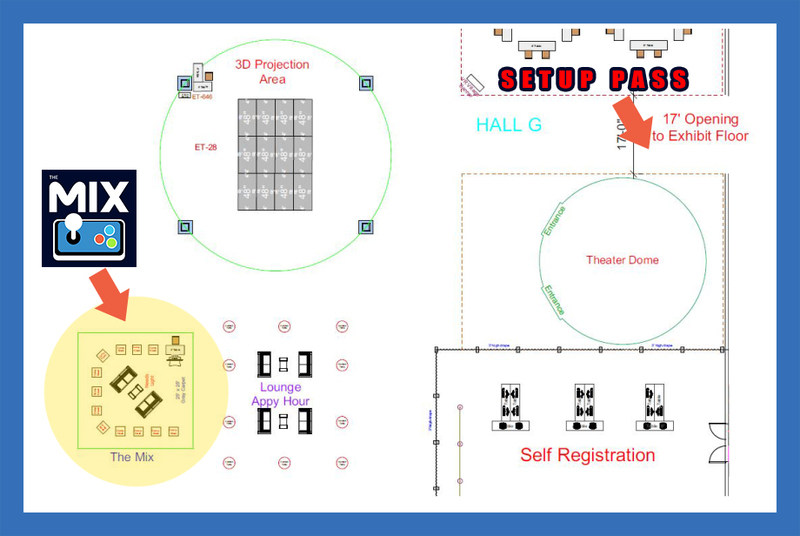 When you arrive at the LACC to begin setup, proceed to the check-in counter at the entrance to South Hall G. The staff at the check-in station will provide you with important instructions for set up. They also will provide you with a 24-hour work pass which is required for entrance into the hall. Please note the checkin hours below because work passes will only be available for pick up during those hours. Each individual helping with setup will need their own work pass. Security guards will check work passes during set up as well as in the mornings or evenings during non-venue hours. Check in and set up begin in South Hall G on Saturday, 8 August at 2pm. For your safety, we ask that you NOT begin set up until you have checked in with the SIGGRAPH staff. Please allow sufficient time for you and your team to setup and have it ready when the venues open Sunday, 9 August at noon. Your installation must be ready by noon Sunday, 9 August, when the venues open to SIGGRAPH attendees. Intel has offered a space in their booth for MIX developers to rotate into throughout the show. You should receive a separate email from The MIX shortly with additional information on this.